Attention those of you always interested in learning new ways to express your inner creative self. The Glass Bottle Crafts 3.0 e-book can help let you release some of your creative ways that are just yearning to escape. This book is filled with step by step instructions in the art of drilling, and cutting glass bottles. The detailed step by step instructions will allow you to transform empty glass bottles into real works of art. Aside from being environmentally conscious you will also be creating unique one of a kind gifts that will transcend ordinary, everyday department store gifts. If you have been holding onto a decanter from a special occasion then there has never been a better time to transform it! Why have an empty bottle sitting around? Sound tacky right? Why not turn it into a lamp or a wind chime? A whole new life awaits these empty vessels that can say so much more than an empty bottle sitting on a shelf. The glass bottle craft book also contains highlights of the many tools that can be used to help reinvigorate your empty glass bottles. Glass bottle cutters and the sanding techniques that can be used give your new glass tumbler a smooth finish. The tools that are mentioned in the book have been reviewed and tested by us and you can read the in-depth reviews on our blog site bottle-lamp. 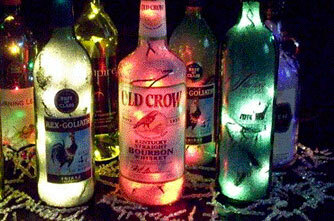 Here are just a few of the many projects that we have made over the years with different empty glass bottles: Lamps, bottles with lights, plant holders, wind chimes, drinking glasses, votive candle holders, flower vases, and a party light string that incorporated left over beer bottle necks (see photo below). The only limit to these projects is your own imagination. Family fun – Nothing brings people together than a shared experience that everyone can participate in. Why not set your kids up with some glass paint and a few empty bottles? Let them decorate and you can incorporate the light sets to illuminate their art work? Those simple glass bottles will become something more endearing and be thought of as a keepsake. Imagine coming across this shared experience years later and having that memory of putting it together. By simply plugging the light string back in you will have ignited a flood of memories that will always be remembered. The glass bottle plant holder. 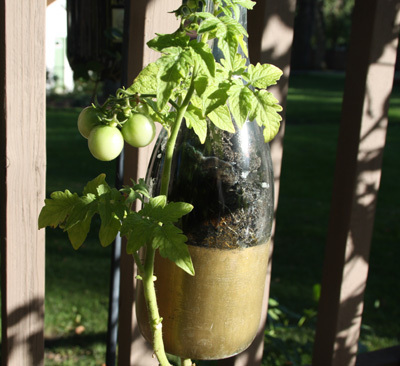 A few years back we made a couple of plant holders from some empty glass bottles. This was really more of an experiment to see if we could add some decor to our back yard patio area. Finding the right plants to grow in a contained space such as this was the easy part. Working with the bottles so that they would hang properly was the challenge. After carefully drilling out the end of these bottles we added the dirt and plant that would literally hang upside down. A wire was then looped around the neck of the bottle that was used to place it on the pant hangers that we had in the yard. Voila! The end result was pretty impressive and the plants actually produced some small cherry tomatoes. It wasn’t enough to put anything together but we would always pick a few when we were outside. Working with filler. 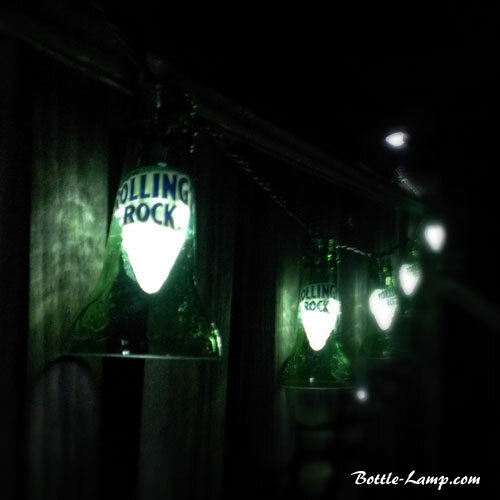 Whether it was a bottle with lights or a working bottle lamp, each individual project had it’s own type of filler that was incorporated into the project. Some of the first bottles that I put together were just a plain light string inside a bottle. It was afterward that I began to experiment with different ways of changing the way that the light was projected. One of the ways that I tried was with the use of crystal fill. Crystal fill is a clear acrylic piece that is often used in floral arrangements. After drilling the hole and putting in the light string, I simply filled the empty space with these little glass pieces. The weight of these bottles was pretty heavy but they allowed the lights from within to illuminate more uniformly. I liked the look but we also wanted to use something a little more lightweight. We experimented with tinsel but it just wasn’t quite the same. The bottle lamp fillers offered yet another creative way to incorporate the feel of the bottle and lampshade itself. 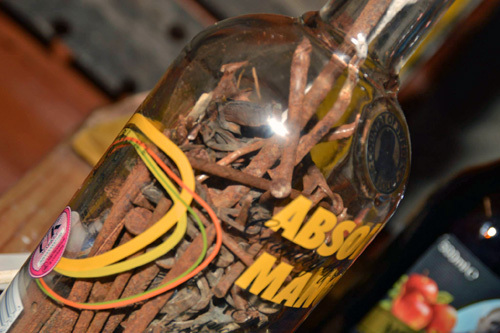 One of my favorites was sent in by one of our readers who had used old rusty nails. By adding the filler to the bottle you are doing more then just hiding the electrical cord that runs through it. You are also giving the bottle stability and offering a decorative flare to your final project. Over the years we have experimented with many different types of fillers and they have all come out with good results. The glass colored marbles will always be my “go to” for these types of crafts. Matching the color to the bottles original content is just another way of showcasing the bottles original purpose. Wind Chimes. One of the projects that I had envisioned doing with the bottle cutter was the wind chimes. My ideas were pretty elaborate and involved not only incorporating cutting the bottles but also drilling them as well. I wanted to run a fish line through the multiple rings and have the weight down at the bottom. 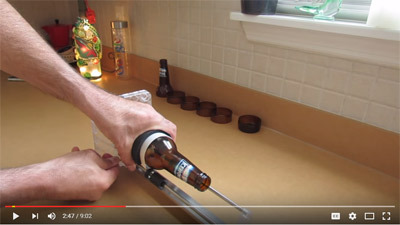 I found the right bottle cutter to allow me to cut the many glass rings that would be needed. the whole thing came to a stand still when it came time to drill the glass holes. The rings just couldn’t hold up to what I was trying to do to them. Ultimately it was our readers who submitted their DIY Show Offs that helped enlighten me on how to actually go about doing it. Flower vases. Both wine and beer bottle labels have evolved into their own art form. After doing the many different bottle crafts for so long I can’t help but look at these bottles and begin to imagine them re-purposed. Choosing a bottle of wine has become more of allowing myself to realize the end purpose rather than the actual contents. 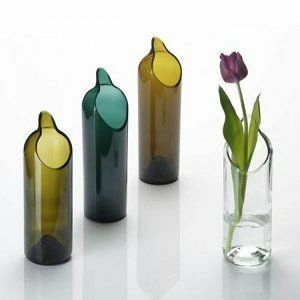 Who knew that by simply cutting off a bottle top you would be able to make a flower vase that is both unique and personal. The time from emptying the bottle to filling it with flowers is so minuscule now that it’s almost eerie. Drinking glasses. 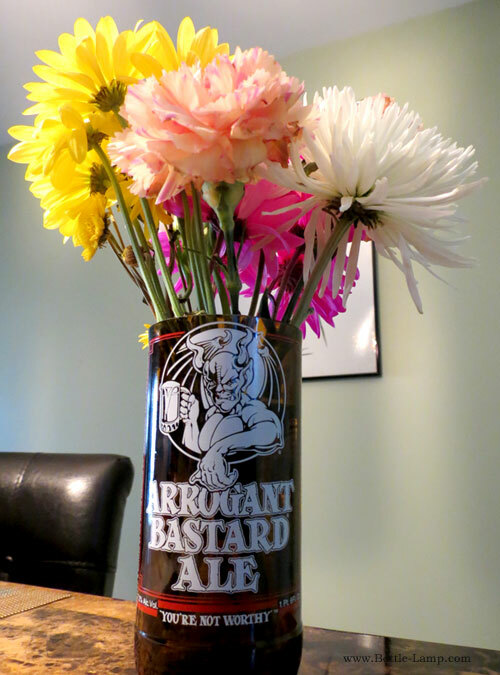 Similar to the flower vases that we have the beer bottles are just as much fun to make in little to no time at all. The most time that you will spend on this project is the sanding. You will want to be more mindful of the glass edges on your drinking glasses then you will on the flower vases. 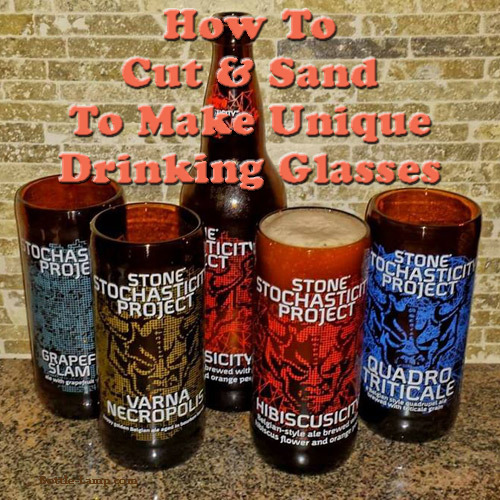 Through all the different glass sanding techniques that are available, making your own set of personal glasses is easy. Votive candle holders. Burning candles can offer more that just rich aromas to your home. The soft glow of a lit candle also offers a way of creating a relaxing ambiance to unwind after a long work day or while taking a warm bubble bath. What better way to showcase these candles then with your own home made candle holder. 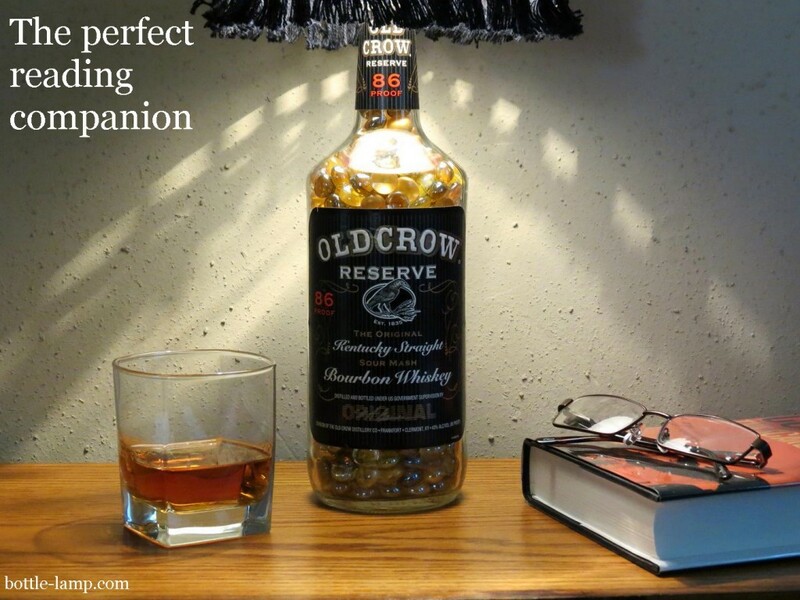 Like the previous flower vase and drinking glass, all you really need to do is score and separate your bottle. 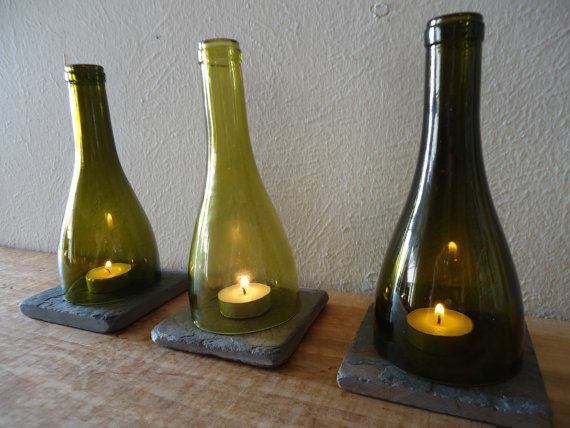 If you are spending any time at all looking on Pinterest at the many different bottle votive candles then you have probably seen the glass bottles that are cut at an angle. I get asked about this one a lot because people want to know how to make them. Honestly, I have never made one of these type of cuts before. Yes, they look cool but the only way that I could possibly see pulling this off is to invest in a wet saw. Personally I can’t make this kind of an investment into something that will be used maybe once or twice and then collecting dust in the corner of my garage. That said, it would be cool to just at least try one once. The Glass Bottle Crafts 3.0 e-book offers you a world of opportunities to up-cycle your old glass bottles and decanters. If you wanted to see a precise, no nonsense way to drill and cut glass bottles then this is the book for you. For the low price of $2.99, you really can’t go wrong! Ideas that put these humble and hard-working mainstays to work past their prime and keep them out of landfills. luciano dombroski. Simple step-by-step instructions, as well as parts lists and images of the completed projects, make sure you will have fun and love the results of your work.